Oh cowboy love stories, they sure know how to reach the heart of a mid-western girl. 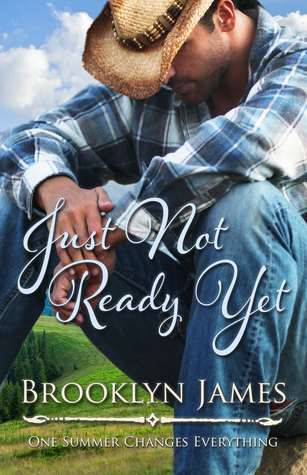 Brooklyn James shares the story of loss and discovery in her novel, Just Not Ready Yet. With main characters like the college temptation, Hunter, and the tall, dark, delicious Cage, readers of the romance genre will delight in this book. Charlie fell in love with her husband in college. He was a complete surprise for her New York family, but she chose him over everything. Now, three years after his untimely death, Charlie is starting to believe the words "it's time to move on." Charlie is a strong female lead and readers will connect with her aching heart and hope for a blossoming future. Cage McCloud has always been there for his family, even though labeled the black sheep. After his brother died, he stepped in to help as much as he can. He definitely didn't expect to fall in love with Charlie. Readers will revel in Cage's character. He's strong, understanding, dependable, humorous and quite attractive. The plot follows Charlie's journey to let go of the past and discover her future. The connection between the characters and the reader will start strong and grow as the summer progresses with a new farm hand and a few dangerous situations on the horizon. The obvious framework being the question of whether Charlie is ready yet. The novel does have a few brazen and intimate situations and a couple curse words thrown in (which kind of feel wrong in this book). Just Not Ready Yet is a romantic story for seasoned readers who enjoy the genre.